A place where people and animals get together. Situated on 14 acres of land, paths meander amongst the animals offering many relaxing hours of wildlife enjoyment. 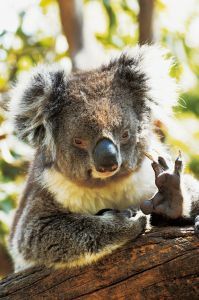 See all your favourite Australian animals such as koalas, wombats, dingoes and Tasmanian devils. Walk amongst and feed the kangaroos and wallabies. A collection of exotic animals to be seen as well including Meerkats, Otters, Alligators and a number of monkey species. A vast range of birds from the Ostrich to the smallest Fairy Wren and everything in between. Some in enclosures but many free flying such as the spectacular colony of Rainbow Lorikeets. Our unique reptile house displays a large number of species of not just reptiles but also fish, insects, amphibians and marsupials. Our cuddly koalas come out for holding daily at 11:30am, 1:30pm and 3:30pm (At no extra charge and subject to weather conditions). Have a cuddle or pat our koalas, take your own photographs or just learn about these fascinating animals from our friendly keepers. Kiosk, souvenir shop, picnic areas and free gas BBQ’s all available for your convenience.